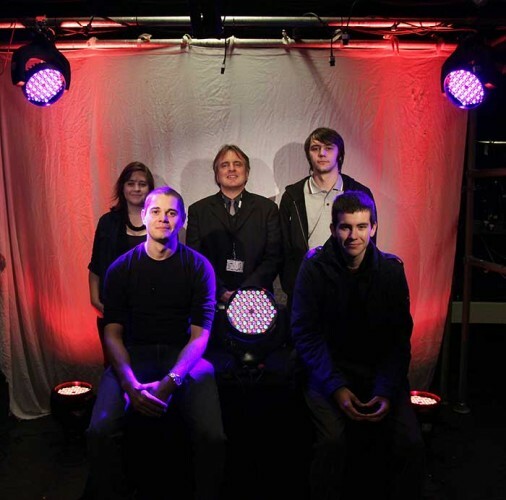 The BA (Hons) Lighting Design programme at Rose Bruford College of Theatre and Performance in Outer London and German Light Products (GLP) are collaborating on enhancing training for the next generation of lighting designers and technicians. GLP’s Udo Künzler and Mark Ravenhill have supplied the College with six Impression 90 LED moving heads on a long term loan. The units have been installed in the college’s unique lighting training and research laboratories, and are available to the lighting design students for projects as well as to augment their designs for a range of innovative lighting projects. Rose Bruford and GLP are collaborating on developing a close partnership, working together to provide the best possible training to students and professionals. This exciting new partnership has been made possible by lighting designer Patrick Woodroffe, who is an Honorary Fellow of the College and regularly visits the Lighting Design programme to run master classes and seminars. Hansjorg Schmidt, programme director lighting design, says: “Patrick has been a fantastic supporter of the programme and the college. He knows our students well and some of them have been working for him during the London Olympic and Paralympic Ceremonies. In picture: Rose Bruford students Sarah Hovind, Andy Lee, Ben Ratcliffe, Karl Aldred and George Hunt with the GLP impression 90 LED heads.